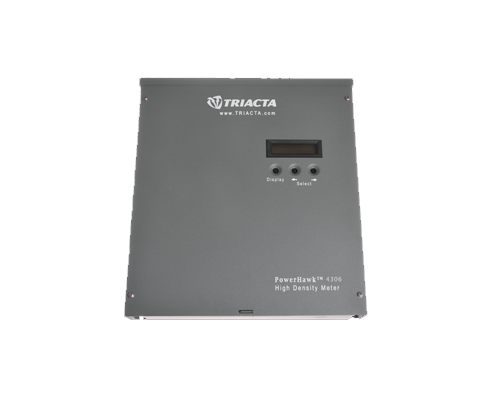 Triacta's PowerHawk 4000 series of smart energy management meters are used to meter or monitor remote loads in multi-tenant buildings, commercial, industrial or institutional spaces. They can be used on their own seamlessly integrated with existing Building Automation Systems, Internet Protocol (IP) based IT servers and business applications such as Energy Management Systems. The PowerHawk 4000 series multi-point meter is designed to meter or monitor branch offices, remote loads and other low density applications. The meter provides up to 24 elements that can be configured for 1, 2 or three element meters. Provides up to 24 meter elements that can be configured for 1, 2 or 3-phase applications. Meters measure full suite of energy data. Fast installation for new or retrofit applications. Meters can be read on-site or remotely. Automatic meter reading and billing compatible. CDFA Certified, Measurement Canada Approved and NYPSC Listed. Measures Wh delivered and received, VARh delivered and received, VAh, Vrms, Irms. Internet Protocol: TCP/IP, DCHP, HTTP, PPP, SNTP, FTP. Datalogging: Non-volatile flash memory unaffected by power outages, stores up to 2.4 years of interval data. Remotely upgradable firmware for future protocol support. 2 Pulse inputs to collect data from electric, water and/or gas meters.